The coloration of its leaves is rather stunning! Some assert that these striking, vibrant plants are the “King of tropical foliage.” But, regardless whether this be an imperial or pauper plant, there is, definitely – in some botanical quarters – a difference of opinion regarding which family it belongs to. Beyond the above several family names, during my perusal of various tomes of botanical data in confirming information on this plant, I noted that it was also – confusingly – classified in the Lilaceae family by a few! However, most folks do concur that it is in the same family as the Agave and Yucca … but, perhaps more on the feminine, delicate, gentle and pretty side! Generally speaking, just remember its simple name – what the Polynesians call it – the Ti (pronounced “tea”) Plant. So popular is it in Hawaii that many consider it the symbol plant of the State. However, it originated in Southeast Asia, Australia and New Zealand and the nearby tropical Pacific area, though I have heard that there is also a South American variety. The green variety was lovingly hauled to Hawaii by its first migrants who felt it a symbol of divine power and used it in Priests’ leis. 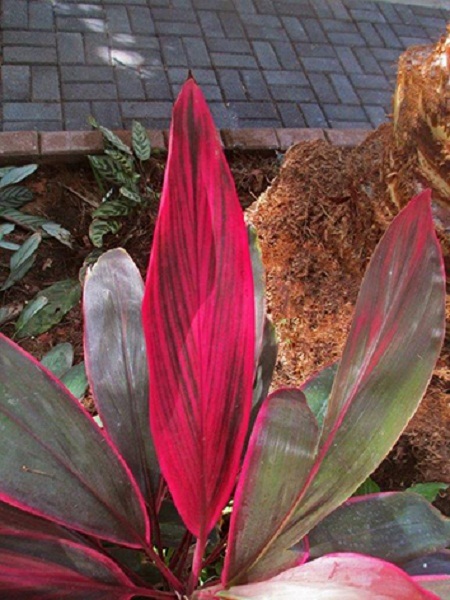 The name Cordyline comes from the Greek word kordyle (a club) and is a reference to its underground rhizomes that are enlarged and club-like. Their tendency to get leggy lends them to best be incorporated with other foliage plants. 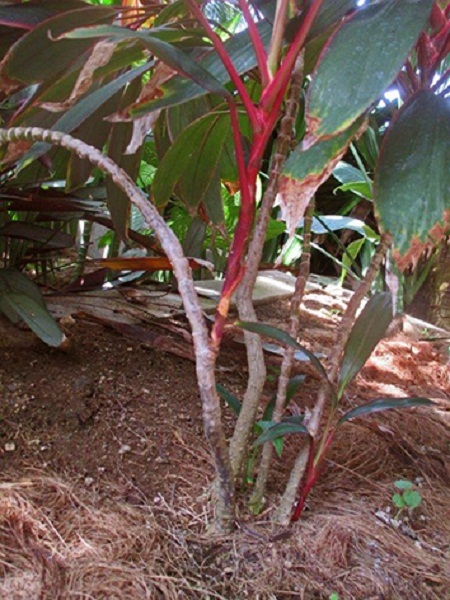 This plant can have either singular or multiple – but generally single – slender stems atop which grow variably formed elliptic to lanceolate leaves. Riffle has said that their leaves “carried on grooved petioles” (the leaf stalks) look somewhat like a “feather duster” often in colors of a “bewildering array.” But, what with its tendency to get a bit “leggy”, it is best employed intermingled with other complementing foliage. Many assert that this beautifully leaved plant achieves its best color in full sun. However, those I have observed that are particularly vibrant, have been accorded good light, but also enjoyed protection from the direct sun – perhaps savoring the good life under a palm canopy of palms during the afternoon heat. 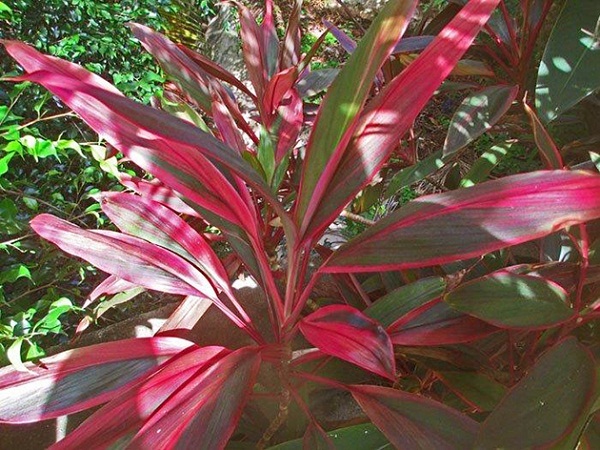 The hybrids of the terminalis species may have variegated leaves or solid green (light to dark in color), yellow, red, purplish-black or the, most preferred, rose-pink as shown here. There are now numerous cultivar (horticulturally, rather than, naturally derived) varieties growing in a veritable rainbow of colors. Terminalis will grow to a height of around four meters (13 feet). Australis, the hardiest growing species – also called the Cabbage Tree – in the wild, can grow quite large and tree-like. But in the more cultivated, domestic environs, as an adult its height may be anywhere from just under 2 meters to 8 meters (5 to 25 feet). Many call these beauties a Ti (pronounced “tea”) Plant. They are somewhat salt and wind tolerant thriving, in some locales, right up next to the beach. They prefer a home of rich soil that will hold nutrients, but drains well as they do not like their feet standing too long in water. But – important here as it is definitely not drought tolerant – water regularly! They like slow release fertilizers and, during their growth time, serve them meals of soluble fertilizer every two weeks. Remember, don’t under water them as this will parch the plant and cause them to grow leggy and dull looking – a stage I survived in the 8th and 9th grade! Stimulate growth by taking cuttings to use in household bouquets – don’t lose sight of the fact that flora is to enjoy when/however. Speaking of which, natives in New Guinea have used the bright leaves in the making of clothing, headwear, thatching and even employed them for medicinal purposes. In other parts of Polynesia pit cooked food is sometimes wrapped in the leaves. Elsewhere it is used for livestock food, perfume, varnish and – lo and behold – even as a drink in Hawaii called Okolehao. Though I have not tried them, the roots purportedly are edible. Of a more practical use, why not try “natural” placemats of their beautiful leaves for a tropical feel at dinner for special guests? Should your parenting instincts kick in and you wish to hear the rustle of little leaves from Cordyline babies, root cuttings will grow quite easily. An indoor plant? Sunny location and warmth … but don’t forget its thirst!